Clear communications are important for central banks at a time when their responsibilities have increased but trust in public institutions has declined. Using an online experiment with a representative sample of the UK population, our recent paper measured how differently styled summaries of the Inflation Report impacted public comprehension and trust in its policy messages. We find that a new ‘Visual Summary’ of the Inflation Report, which makes use of graphics and simpler language, increases understanding of policy messages. And making more changes using insights from behavioural science can further increase public understanding. These changes also somewhat increase people’s trust in the information. Greenspan was poking fun at the fact that central bankers have historically had a reputation for being enigmatic and sometimes aloof. More recently, however, there is an emerging consensus in the central banking community that there is nothing constructive about ambiguity. Instead, central bankers increasingly aspire to make their communications clear to the general public in order to enhance the effectiveness of their policies and ensure their legitimacy. The Bank of England is a good example. 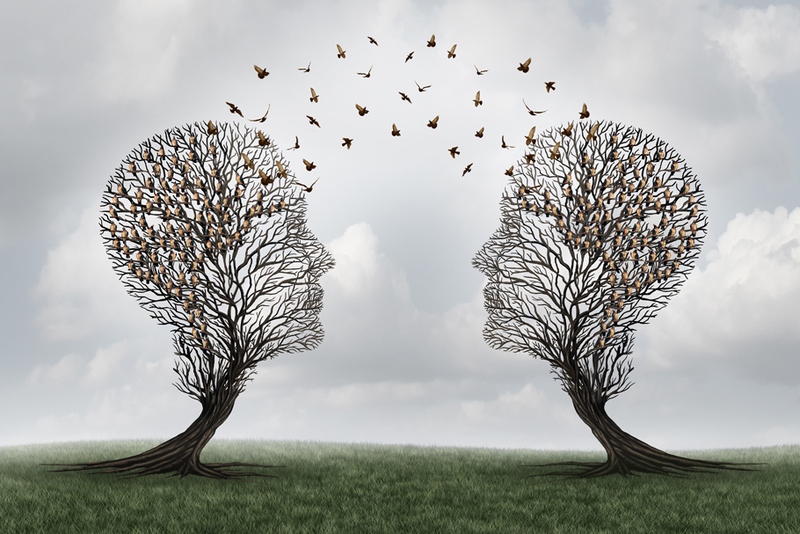 One way the Bank is trying to communicate more clearly is by creating different versions or so-called ‘layers’ of its key publications to serve the needs of different audiences. For example, last year the Bank launched a new ‘layered’ Inflation Report, its quarterly summary of the outlook for the UK economy. The new report consists of three different layers, all based on the same underlying analysis, but pitched differently. So how successful is this new communications approach? In order to see whether the new Inflation Report enhances public trust and comprehension in its policy messages, we conducted a large-scale online experiment with over 2,000 people. Participants in the experiment were representative of the UK population. They were randomly assigned to read one of four Inflation Report summaries. One of these was the Monetary Policy Summary from the February 2018 Inflation Report. This layer of the Inflation Report addresses a specialist economics audience. It is quite technical and contains no pictures, charts or graphics. Some of the other participants in the experiment were assigned to read the Visual Summary, also from the February 2018 Inflation Report. This new version of the Inflation Report is intended to address the general public. The Visual Summary is free of most jargon and, as the name implies, contains many charts and icons. The Monetary Policy Summary and the Visual Summary are official Bank publications. For the purposes of this experiment, we also designed two unofficial versions. 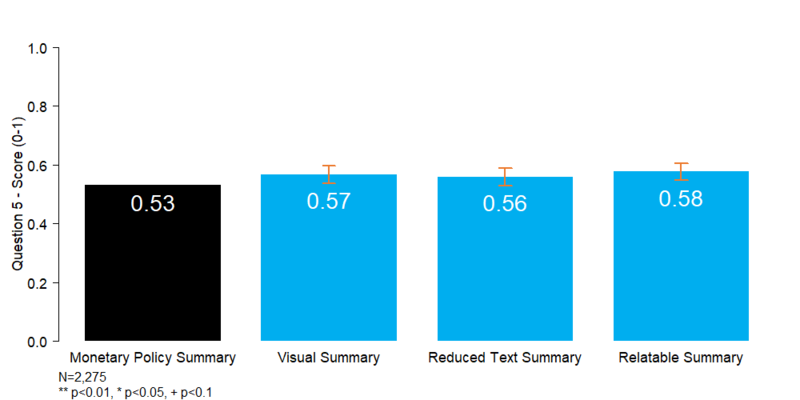 One of them, the Reduced Text Summary, was an abbreviated version of the Visual Summary, with 50% fewer words. 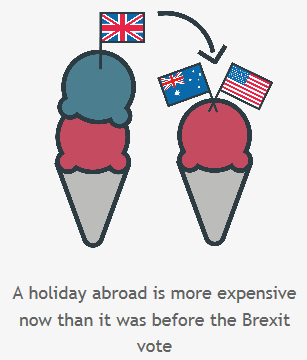 The other, which we dubbed the Relatable Summary, used insights from psychology and behavioural economics to make policy messages more relatable to people’s lives. For instance, we explained the Bank of England’s 2% inflation target in terms of the prices people should expect to pay in shops next year (Figure 1). After reading their respective summaries, participants were asked a common set of questions. These included five multiple choice comprehension questions that tested participants on the policy messages in the summaries. We also asked a couple of questions about how much participants trusted the information they read. We followed best practice in psychology and pre-registered the ordinary least square regression tests we conducted. The most important finding from our research is that the newly introduced Visual Summary boosted public understanding of the Inflation Report’s main policy messages in a statistically significant way compared to the Monetary Policy Summary. 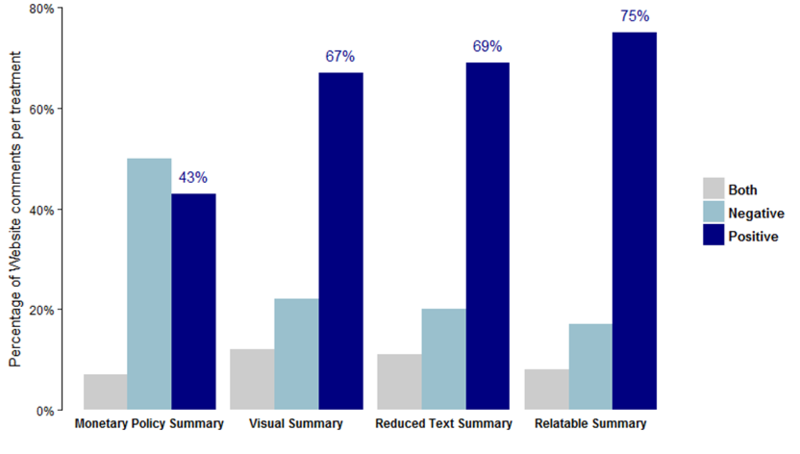 The participants who understood the most were those who read the Relatable Summary. The average score of these participants was 40% higher than the scores of those who read the Monetary Policy Summary. 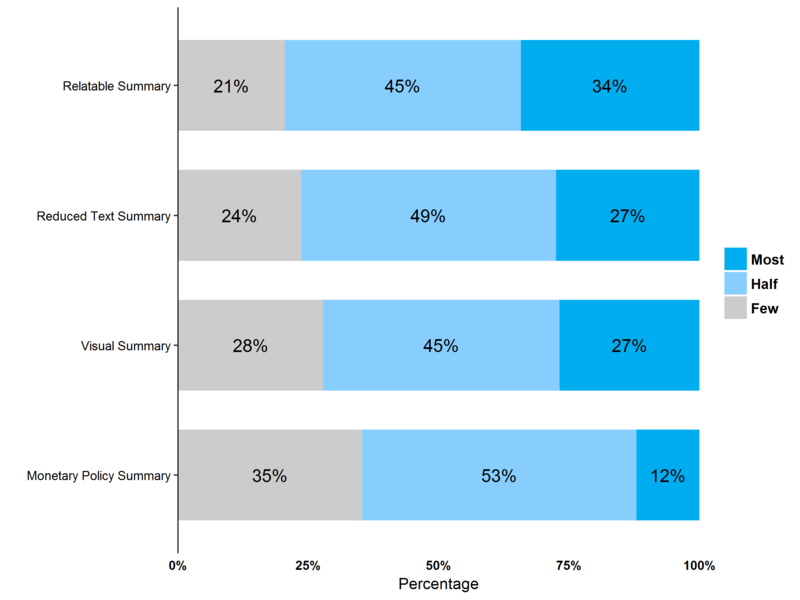 So while only around 1 in 8 participants got most (4 or all 5) comprehension questions correct, 1 in 3 did so among those who read the Relatable Summary (Figure 2). 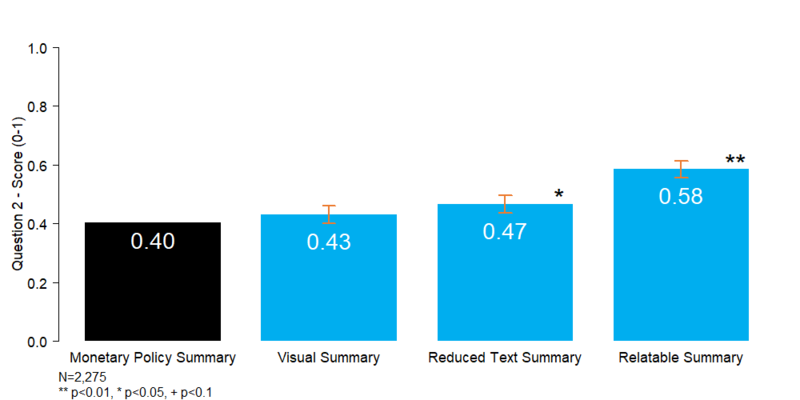 Improvements in comprehension scores by those who read the Relatable Summary was observed across almost all of the five individual comprehension questions (Figure 3). The only question where participants performed similarly across the groups was the fifth question which asked participants to select the Bank’s current interest rate. The similar levels of understanding observed on this question is likely due to the fact that the interest rate decision was effectively highlighted in all versions of the Inflation Report summaries. 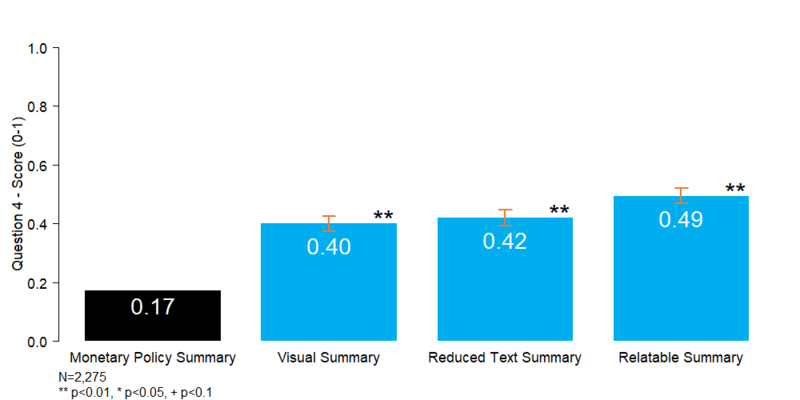 The impact that different styles of the summaries had on trust was less pronounced. Participants who read the Relatable Summary did report greater levels of trust in the information they read compared to those who read the Monetary Policy Summary, but the score increases were minor. Furthermore, reading different summaries of the Inflation Report did not markedly change public attitudes towards the Bank. Besides the primary analysis we pre-registered, we also conducted a series of ad-hoc, ex-post exploratory analyses. 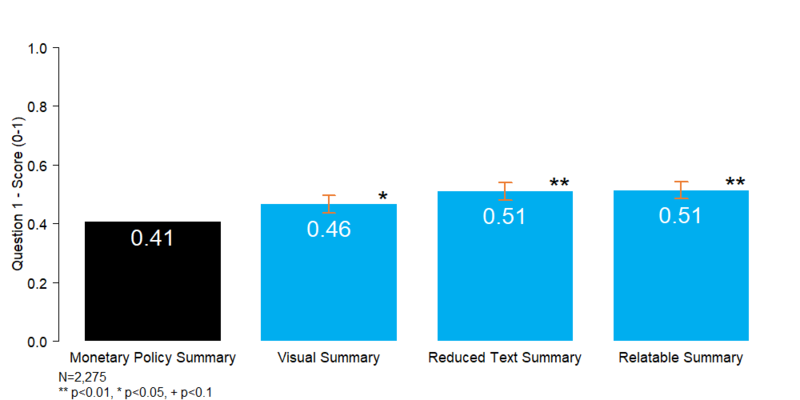 For example, qualitative analysis of comments made by participants who read different summaries seemed to reinforce the broad pattern we saw across the experiment, with the Visual Summary and Relatable Summary outperforming the Monetary Policy Summary (Figure 4). 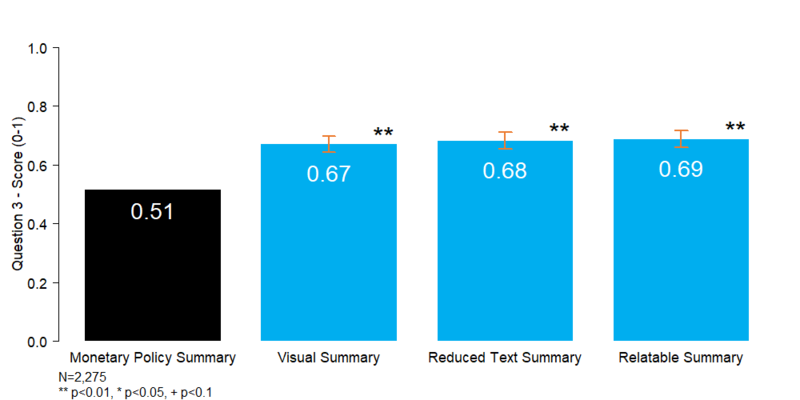 We also observed an interesting relationship between comprehension and trust scores. 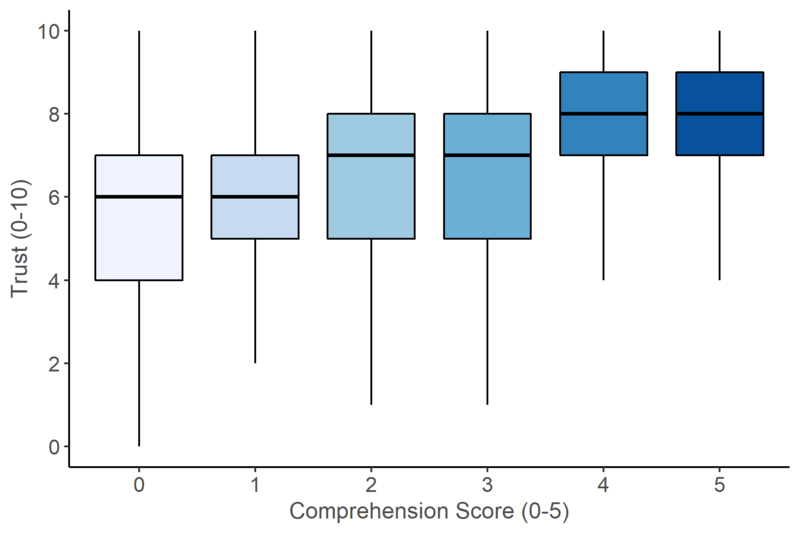 Figure 5 contains box and whisker plots of the relationship between participants’ comprehension and trust scores. For a given comprehension score, the box represents the interquartile range of associated trust scores. The line in the box represents the median trust score associated with a given comprehension score. And the lines extending from the box (aka ‘the whiskers) go out to the minimum and maximum trust scores associated with a given comprehension score. As the figure shows, we observed that higher levels of comprehension were typically associated with higher levels of reported trust. We think our findings can help central banks improve how they communicate with the people they serve. Alongside quantitative easing and other unconventional forms of monetary policy, communication has emerged in recent years as an additional arrow in central banks’ quiver for stabilising economies at the zero lower bound, especially in crises. For example, Mario Draghi’s famous declaration that the ECB would ‘do whatever it takes’ was arguably the single most important intervention that tempered the Eurozone crisis. Like Draghi, central bankers across the world increasingly aspire to make their communications clear to the general public in order to enhance the effectiveness of policy and ensure its legitimacy. What specific aspects of ‘relatability’ make it so effective at communicating economic information? What other communicative strategies besides relatability can help people process economic information? How can central banks better communicate the uncertainty inherent in economic forecasts? How does the mediation of central bank communications through traditional and social media affect people’s understanding of key policy messages? David Bholat and Eryk Walczak work in the Bank’s Advanced Analytics Division and Nida Broughton and Janna Ter Meer work for the Behavioural Insights Team. I really like this and I hope that many communicators, not just central bankers, take note. In an era where central banks are trying to both increase public trust and increase the effectiveness of their words, keeping things relatable kills two birds with one stone. However, it is difficult! For example, Figure 1 was intuitive, but I didn’t really understand Figure 6 – it confused me more than anything.